USDA provided several key updates last week when it released the July Cattle inventory report along with its monthly Cattle on Feed report. The mid-year cattle inventory report provided the first estimate of the 2017 calf crop, which at 36.3 million head was 3.5 percent larger than the 2016 calf crop. The year-over-year increase in the calf crop’s size was slightly larger than in 2016, when the U.S. calf crop increased 2.9 percent compared to the prior year. 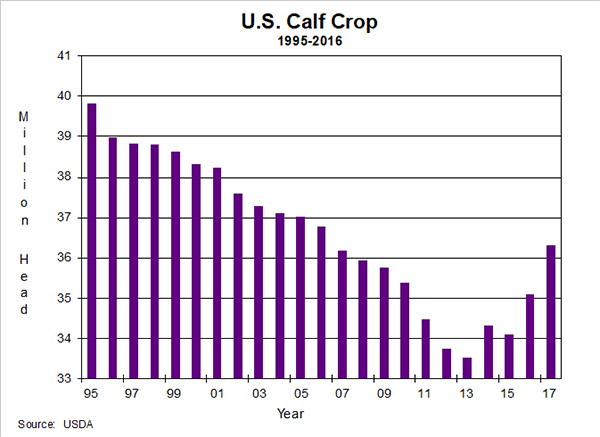 This is the third consecutive year that the calf crop size has increased after bottoming out at 33.5 million head in 2014. The calf crop increase continues to point to larger slaughter cattle supplies in both 2018 and 2019, despite the downturn in profitability experienced by U.S. cow-calf operations. Year-to-year comparisons of other data included in the cattle inventory report are not possible since USDA did not publish the mid-year report last year because of budget pressure. Despite that shortcoming, the report does provide some key insights into developing changes in the industry. The July 1 all cattle and calves inventory estimate was 102.6 million head, which was the first time the July inventory was above 100 million head since 2011. The beef cow inventory of 32.5 million head was 6.6 percent larger than two years ago and was the largest July inventory since 2008. Both of these estimates are consistent with the expansion observed on the January inventory report. Although it’s not clear from the report that beef industry expansion has come to a grinding halt, it does suggest expansion interest is waning. For example, the number of beef heifers being held by producers for herd replacement on July 1st was 2 percent smaller than in 2015 and, when expressed as a percentage of the beef cow inventory totaled just 14.5 percent. In contrast, when the beef industry was expanding rapidly this ratio climbed above 15 percent. Additionally, the ratio of female (cow and heifer) slaughter relative to steer slaughter has been above a year ago 5 out of the last six months, the exception occurring in February. The increase in female relative to steer slaughter suggests herd expansion has slowed, if it has not actually come to a complete halt. USDA’s Cattle on Feed report confirmed that the on feed inventory remains well above last year. Early in 2017 the on feed inventory was very near a year earlier, but net placements on feed have been substantially above the prior year every month except February. The placement build-up means that, despite a good marketing pace throughout 2017, pushed the on feed inventory up with a July 1 inventory that was 4.5 percent above the prior year. The combination of a larger cattle on feed inventory and larger placements both point to fed cattle marketings during the last half of 2017 remaining above 2016’s. Commercial cattle slaughter was 6.5 percent larger during the first half of 2017 than in 2016. But cattle weights were lower than a year earlier, averaging 1.7 percent below the January-June 2016 average. As a result, beef production during 2017’s first half increased just 4.8 percent compared to the same period in 2016. The on feed inventory and placement pattern both point to beef production remaining above a year earlier throughout the rest of 2017, although the year-over-year increases are expected to moderate. Recent eastern Corn Belt calf prices, although based on seasonally small summer calf marketings, have been modestly higher than a year ago. Prices in Kentucky markets reported by USDA for 500-600 pound steers averaged in the mid-$150s during the first half of July, compared to the mid-$140s a year earlier. Prices are likely to remain near that range, with seasonal weakness expected in October when calf marketings increase. 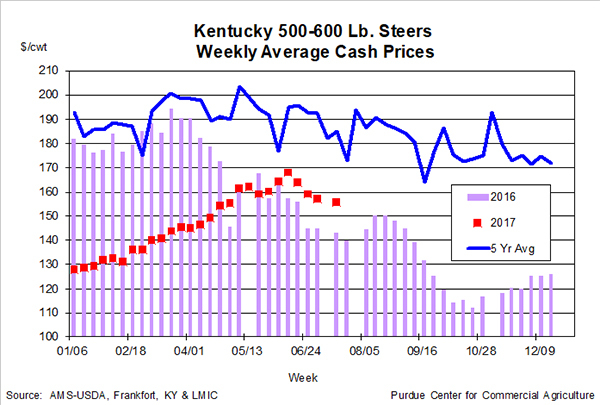 Last year prices for 500-600 pound steers in Kentucky dropped into the $112 to $120 range in October and early November. Prices for 500-600 pound Kentucky steers this fall are expected to be somewhat stronger than in fall 2016, but feed grain price movement between now and fall could have an effect on prices. If feed prices remain near recent levels, prices in Kentucky markets for 500-600 pound steers could average in the $120s to the $130s.